Welcome to Day #2 of Appetizer Week, a multi-blogger event co-hosted by Kim of Cravings of a Lunatic and Kristen from Frugal Antics of a Harried Homemaker. With the big football game coming up, we wanted to make sure you had plenty of ideas for your game day spread. Each day we will be dishing up a different set of appetizers. We hope you enjoy this fabulous group of recipes. Tune in each day starting with Monday, January 20 and ending on Saturday, January 25. I’m so glad you decided to come back for Day 2 of Appetizer Week! Today I’m sharing an Easy Low-Carb Chicken Dip recipe with you. This is a great recipe to make when you’re in a time crunch or if you just don’t feel like spending a lot of time in the kitchen. It literally took me maybe 10 minutes from start to finish! How awesome is that? 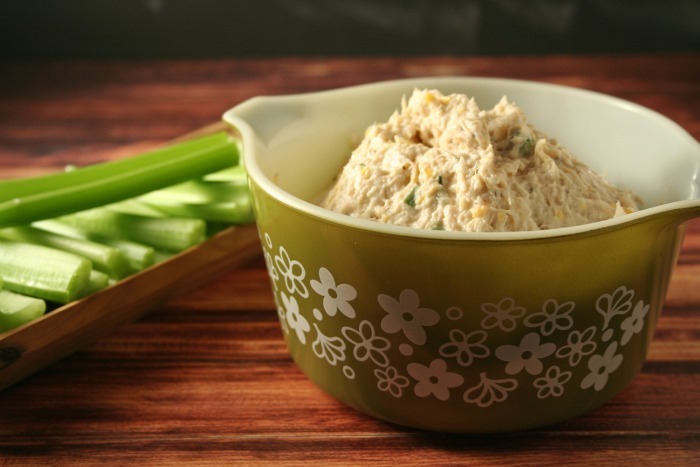 Make sure you read all of the way to the bottom of this post for more great Appetizer Recipes from super talented Bloggers as well as a Fabulous and I mean FABULOUS giveaway from Anolon!! You won’t want to miss any of it. Don’t be fooled by the quick prep time on this dish because it’s still delicious and a big hit! Your guests are going to love it and you’re going to love not spending a bunch of extra time in the kitchen. My daughter shared this with us on New Year’s Eve and I couldn’t believe how simple it was when she told me how to make it. Put chicken in a bowl and flake. Add salt, pepper and mayonnaise to chicken and stir well. Add green onions and cheese then mix to combine. *Note – I served this with celery to keep the carbs down. You can serve it with any type of cracker as well if carbs are not a concern for you. Today’s sponsor is Anolon. 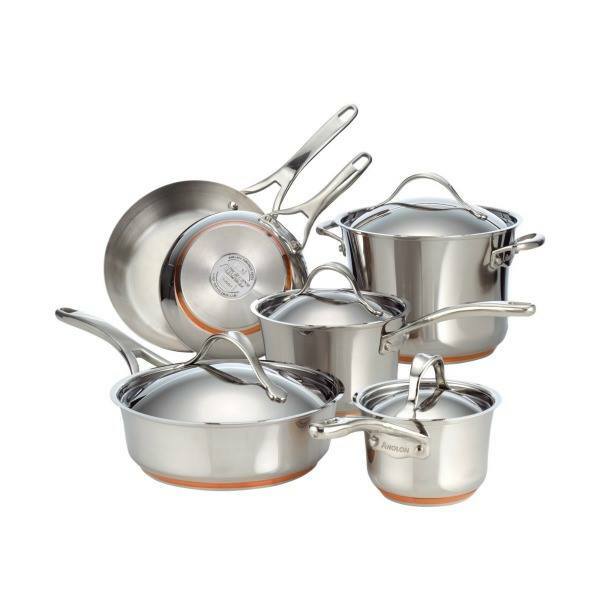 They are providing an Anolon Nouvelle Copper Stainless Steel Collection 10-piece set, which includes1.25 Qt. & 2.5 Qt. covered saucepans, 3 Qt. covered saute, 6.5 Qt. covered stockpot, 8″ & 10″ French skillets. This Anolon Set has a stunning, high polish finish that would class up any kitchen. The set is crafted with a layer of copper on the bottom which provides optimum heat conduction. This Anolon collection is also dishwasher safe. Anolon Nouvelle Copper Stainless Steel cookware is gorgeous and will withstand the test of time. Giveaway is open to U.S. residents only. Winner must be 18 years of age, or older. Winner will be selected randomly. Winner will be contacted via email and has 72 hours to respond before a new winner is drawn. Good luck! Tuna Bruschetta by What’s Cooking, Love? 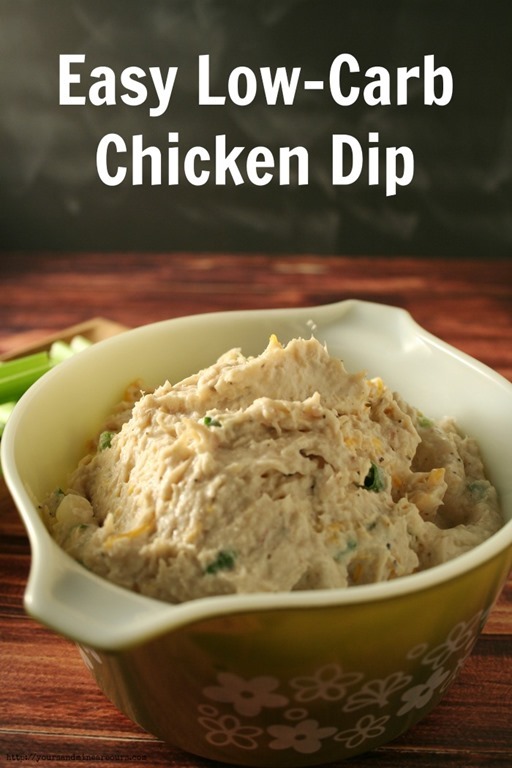 The Low Carb Chicken Dip is right up my alley~I want it w/BBQ Pork Rinds!! Oh now I need to try that! My favorite is buffalo wings. Oh I love the variations you have with yours. I will have to give that a try sometime.